would be a great idea to have a country wide competition to determine who is the best player of all..
After months of organizing, The First Annual Dream Land's Avalanche Competition was finally announced. To be held at the Dream Fountain, this would be the biggest event in the history of Dream Land! The rules for the competition are quite simple: Everyone will travel by foot to the Dream Fountain. If, while on their journey, two Dream Landers happen to meet, they must challenge each other to an Avalanche match. Only the winner of the match may continue onward towards the Dream Fountain. In this way, the number of competitors will be whittled down to a manageable size before the final action at the Dream Fountain. Can you help guide Kirby through the competition so he arrives successfully at the Dream Fountain? Can he rise above the grizzled veterans and achieve his dream of becoming the reigning champion? His fate is in your hands! Kirby's Avalanche is a lot of fun if you like puzzle games. It's a classic puzzle game with the "blocks" falling down from the top as you try to get rid of them. Try to connect at least four bubbles of the same color to make them pop. The biggest difference is that the bubbles will connect to each other vertically OR horizontally. Usually it's one way or the other. 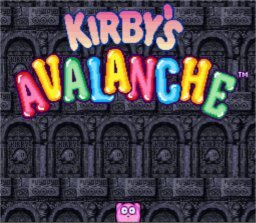 Kirby's Avalanche is definitely worth a try. A + B + X + Y on Controller Two. 2. Reset the game and release the buttons. 3. Go into Options, and you'll find the Special Custom mode under Custom.